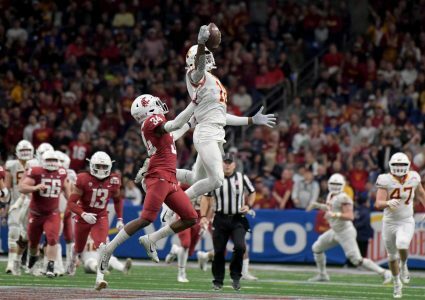 AMES — Last Sunday night, Hakeem Butler’s mind drifted from football. 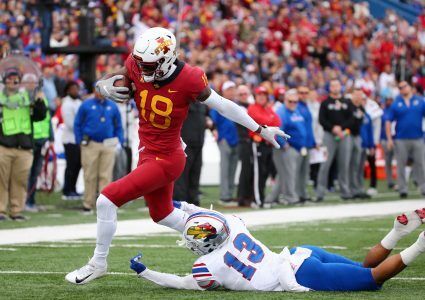 Iowa State’s 6-6 highlight-reel staple had made a pair of nationally-treasured circus touchdown catches in the Cyclones’ 27-3 rout at Kansas the previous day, but he trained his next-day focus on other TV-based scenes. Instead of a football, Butler cradled a video game controller, nimbly moving his fingers and thumbs while winding through multiple “Call of Duty” missions. A text from teammate Kyle Kempt lit up his phone. Huh? Turns out Butler’s childhood football hero, Randy Moss, was honoring his performance at No. 1 on his Sunday Night “You Got Mossed!” segment on ESPN. Butler wears No. 18 — just like Moss did as his incredible career wound down in Oakland. It’s a nod to his childhood idol, but that’s not the only reason he dons jerseys emblazoned with the 1-8. Butler, who owns a Big 12-best eight catches spanning 40 or more yards, didn’t even really start playing organized football until moving from his hometown of Baltimore to the Houston area for high school. Basketball was Butler’s game and he excelled both on the AAU circuit and for Travis High School. But his once-unpolished football skills eventually overshadowed his hoops prowess — and former ISU head coach Paul Rhoads offered him a scholarship. Jaws drop just about every time Butler takes the field now. “What a play by Butler,” Moss intoned as he narrated footage of Butler’s second touchdown against the Jayhawks. What a play indeed. And, as Butler said, “crazy” to hear it properly described as such from his favorite player growing up. He even has a favorite Moss memory — his famed Thanksgiving performance against the Cowboys in 1998. Butler was just two-years-old when Moss made three catches of 50-plus yards (all touchdowns) in the Vikings’ win, but he still marvels at the feat. “That’s crazy to me,” Butler said. It never made Butler a Vikings fan, though. Baltimore is home. Always will be. Now it’s Butler who’s achieving and chasing “crazy” milestones. 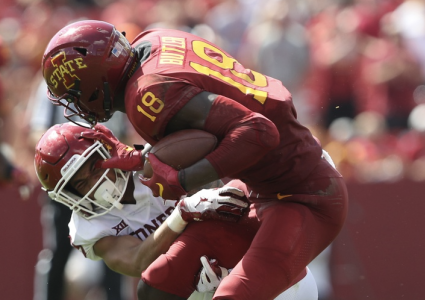 If Butler makes a touchdown catch for the surging Cyclones (5-3, 4-2 Big 12) in Saturday’s 2:30 p.m. FS1-televised home game against Baylor (5-4, 3-3), he’ll do so in a fifth-straight game, which would tie a single-second program record. 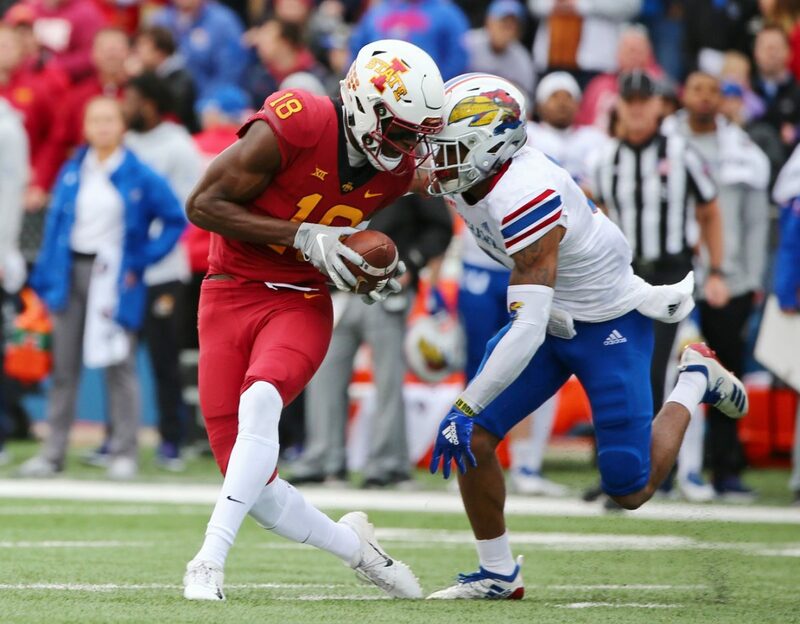 If he snags three more touchdown grabs this season, he’ll break former standout Allen Lazard’s all-time single-season mark of 10 set last season. Not bad for a formerly raw and mostly untapped talent who looked up to — and is now praised by — the great Randy Moss.